Carl Buhr Blitz champion 2015! Even though it is a bit late, it is time to sum up the internal Europchess tournaments of 2015. 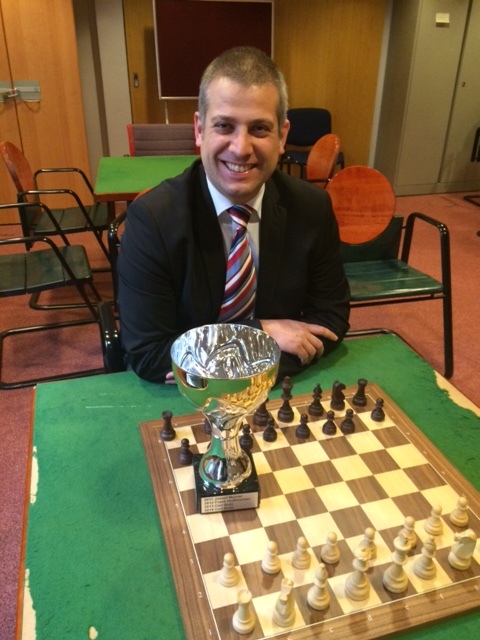 On 16 December 2015, the Ronny Bonne-Blitz championship ended with a clear victory of Carl Buhr. Over forty players have participated over the year in 23 sessions, playing five 3+2 minute games during a lunch-break according to the Swiss system. Our German FIDE Master, who also plays on the first board of the first team in the inter-clubs, collected with 65/75 out of the 15 best sessions an amazing score: it means that Carl took on average more than 4/5 in every session! Even more stunning: We see Carl winning the cup for the third time in a row now: Congratulations! Much less evident was the outcome on the lower ranks. For a long time, Martin Müller led the field. Martin showed up every session and brought home a full bag of 73.5 points. When taking the best of 15, he came to 57.5/75, which is an excellent result of more than 3.5/5 per session. This would have gained him the second rank, were it not for a last-minute effort of Frank Hoffmeister to hold him back with the slight margin of 59/75. The club President thus overtook Martin in round 22 just before the latter left to London for the London Classics! The next ranks were taken by Georgi Tomov (51), Luis Busquets Perez (43.5), Christophe Keller (38), Georges Vassilakis (36.5) and tournament director Jesper Abrahamsen (35). As usual, Jesper has conducted the tournament in an impeccable manner. For 2016, we hope for another exciting battle – and whoever may dare challenging Carl on his throne is welcome!